Whether you’re coming from a two-year community college or a four-year school, we want your transfer experience to be stress-free. We work with colleges in the region to ease your transition to Augsburg. The first step is to set up a free, unofficial transcript evaluation by calling 612-330-1001 or emailing transfer@augsburg.edu. Show us what you’ve taken, and an admissions counselor can let you know which courses and credits may transfer to Augsburg. It is required that a student have 12 transferable credits to enter the program. Please contact an admissions counselor with any questions. If Augsburg is in your future, our admissions counselors can help you plan courses to maximize transfer credit down the road. If you are currently enrolled in a Minnesota community college, please refer to our major agreements and transfer guides that will help you identify the courses that transfer flawlessly to Augsburg. We also accept credit for previous work and life experience through exams, transfer credit, and assessment of previous learning. Please contact an admissions counselor for more details. 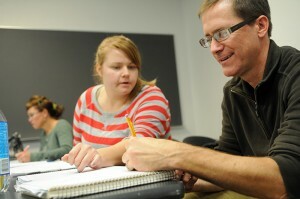 Students admitted to Augsburg with 52 semester credits accepted in transfer are considered Advanced Transfer Students. Specific graduation requirements may be waived with advanced standing. Students transferring from the Minnesota State Colleges and Universities system who have completed an Associate of Arts degree and/or the Minnesota Transfer Curriculum have specific graduation requirements waived upon acceptance to Augsburg. Please contact an admissions counselor for more details.